ESA's Planck satellite, a mission with significant participation from NASA, has revealed that the first stars in the universe started forming later than previous observations of the cosmic microwave background indicated. The background is the most ancient light in the history of the cosmos, dating back to 380,000 years after the big bang. This new analysis also shows that these stars were the only sources needed to clear the "opaque fog" that permeated the early universe. As these first stars came to life, their light split neutral atoms apart, making the universe transparent. Scientists refer to this as the "epoch of reionization." Planck data show this was a quick process, which was half-complete when the universe had reached an age of 700 million years. "Thanks to better measurements with Planck, we're confident that reionization occurred later than previous, less precise measurements indicated. That's exciting for scientists because the stars we already know about fit that timeline," said Charles Lawrence, the U.S. project scientist for the mission at NASA's Jet Propulsion Laboratory in Pasadena, California. ESA's Planck satellite has revealed that the first stars in the Universe started forming later than previous observations of the Cosmic Microwave Background indicated. This new analysis also shows that these stars were the only sources needed to account for reionising atoms in the cosmos, having completed half of this process when the Universe had reached an age of 700 million years. With the multitude of stars and galaxies that populate the present Universe, it's hard to imagine how different our 13.8 billion year cosmos was when it was only a few seconds old. At that early phase, it was a hot, dense primordial soup of particles, mostly electrons, protons, neutrinos, and photons – the particles of light. In such a dense environment the Universe appeared like an 'opaque' fog, as light particles could not travel any significant distance before colliding with electrons. Today, telescopes like Planck can observe this fossil light across the entire sky as the Cosmic Microwave Background, or CMB. Its distribution on the sky reveals tiny fluctuations that contain a wealth of information about the history, composition and geometry of the Universe. The release of the CMB happened at the time when electrons and protons joined to form hydrogen atoms. This is the first moment in the history of the cosmos when matter was in an electrically neutral state. After that, a few hundred million years passed before these atoms could assemble and eventually give rise to the Universe's first generation of stars. As these first stars came to life, they filled their surroundings with light, which subsequently split neutral atoms apart, turning them back into their constituent particles: electrons and protons. Scientists refer to this as the 'epoch of reionisation'. It did not take long for most material in the Universe to become completely ionised, and – except in a very few, isolated places – it has been like that ever since. Observations of very distant galaxies hosting supermassive black holes indicate that the Universe had been completely reionised by the time it was about 900 million years old. The starting point of this process, however, is much harder to determine and has been a hotly debated topic in recent years. "The CMB can tell us when the epoch of reionisation started and, in turn, when the first stars formed in the Universe," explains Jan Tauber, Planck project scientist at ESA. To make this measurement, scientists exploit the fact that a fraction of the CMB is polarised: part of the light vibrates in a preferred direction. This results from CMB photons bouncing off electrons – something that happened very frequently in the primordial soup, before the CMB was released, and then again later, after reionisation, when light from the first stars brought free electrons back onto the cosmic stage. "It is in the tiny fluctuations of the CMB polarisation that we can see the influence of the reionisation process and deduce when it began," adds Tauber. A first estimate of the epoch of reionisation came in 2003 from NASA's Wilkinson Microwave Anisotropy Probe (WMAP), suggesting that this process might have started early in cosmic history, when the Universe was only a couple of hundred million years old. This result was problematic, because there is no evidence that any stars had formed by then, which would mean postulating the existence of other, exotic sources that could have caused the reionisation at that time. This first estimate was soon to be corrected, as subsequent data from WMAP pushed the starting time to later epochs, indicating that the Universe had not been significantly reionised until at least some 450 million years into its history. This eased, but did not completely solve the puzzle: although the earliest of the first stars have been observed to be present already when the Universe was 300 to 400 million years old, it remained unclear whether these stars were the main culprits for reionising fully the cosmos or whether additional, more exotic sources must have played a role too. 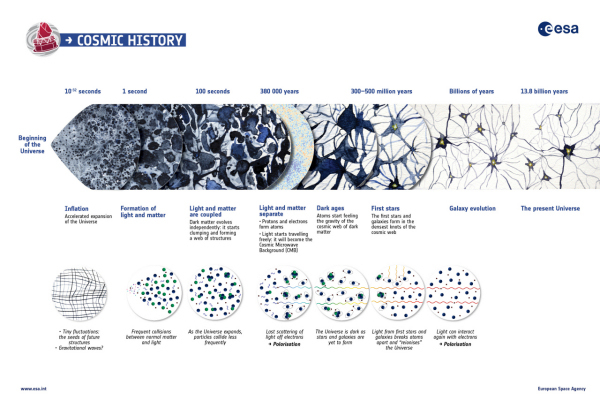 In 2015, the Planck Collaboration provided new data to tackle the problem, moving the reionisation epoch even later in cosmic history and revealing that this process was about half-way through when the Universe was around 550 million years old. 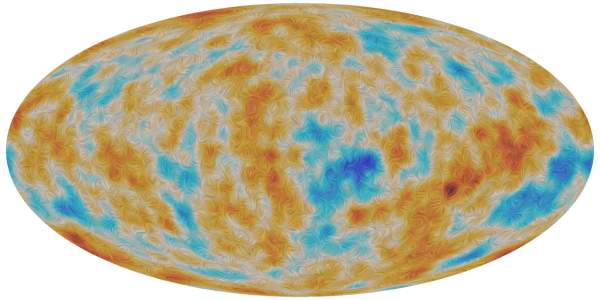 The result was based on Planck's first all-sky maps of the CMB polarisation, obtained with its Low-Frequency Instrument (LFI). Now, a new analysis of data from Planck's other detector, the High-Frequency Instrument (HFI), which is more sensitive to this phenomenon than any other so far, shows that reionisation started even later – much later than any previous data have suggested. "The highly sensitive measurements from HFI have clearly demonstrated that reionisation was a very quick process, starting fairly late in cosmic history and having half-reionised the Universe by the time it was about 700 million years old," says Jean-Loup Puget from Institut d'Astrophysique Spatiale in Orsay, France, principal investigator of Planck's HFI. "These results are now helping us to model the beginning of the reionisation phase." "We have also confirmed that no other agents are needed, besides the first stars, to reionise the Universe," adds Matthieu Tristram, a Planck Collaboration scientist at Laboratoire de l'Accélérateur Linéaire in Orsay, France. The new study locates the formation of the first stars much later than previously thought on the cosmic timeline, suggesting that the first generation of galaxies are well within the observational reach of future astronomical facilities, and possibly even some current ones. In fact, it is likely that some of the very first galaxies have already been detected with long exposures, such as the Hubble Ultra Deep Field observed with the NASA/ESA Hubble Space Telescope, and it will be easier than expected to catch many more with future observatories such as the NASA/ESA/CSA James Webb Space Telescope. 'Planck intermediate results. XLVII. Planck constraints on reionization history' and 'Planck intermediate results. XLVI. Reduction of large-scale systematic effects in HFI polarization maps and estimation of the reionization optical depth' by the Planck Collaboration are published in Astronomy and Astrophysics.